I have always been a creative type of person, and it started at an early age. My mother had me involved in so many things growing up... stuff like skating, dancing, Brownies and Girl Guides, playgroups, and enrolled me into an arts school. Even though I already had many years of tap and jazz, I ended up auditioning for visual arts... my mother was creative, and I had picked up the same gene. Even though I don't find much time to draw or paint anymore, I still manage to enjoy the odd colouring fest. Yes, I'm not embarrassed to say I love colouring, and I recently introduced my daughter to it. With her being only 15 months, when we colour together I'm partially afraid of her colouring the apartment instead of the colouring book. I recently came across a Paper-to-digital Colouring book by Painting Lulu, which has saved me hours of trying to remove crayons or markers from a surface. The company currently offers 6 beautiful coloring books including My Little Pony, Transformers Rescue Bots, Tonka, Barbie, Hot Wheels and Lulu & Friends! Color with digital crayons, brushes and markers! 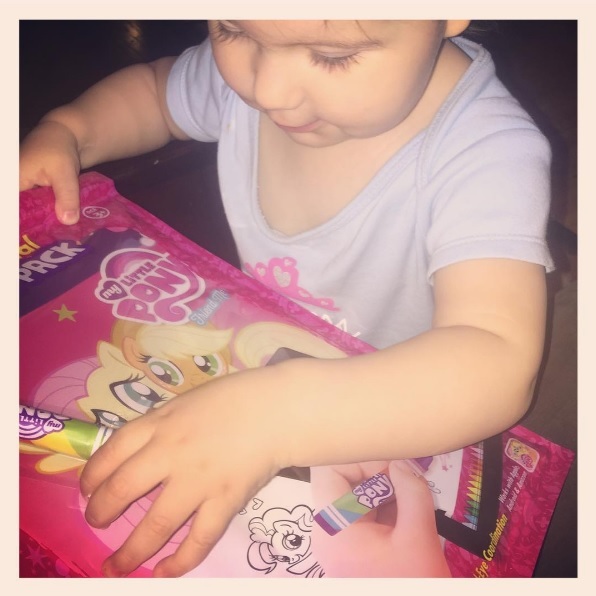 I was sent the My Little Pony book, and Brianna loved it from the moment I opened the package. She was automatically attracted to the bright pink colour, and couldn't stop pointing at the two ponies on the cover. The book contains 32 fun filled pages of girlie fun, that you can colour over and over again. Once I opened the package, there's a code on the inside of the front cover... this is to give you access to the book once you download the application on your cellphone/tablet. I created an account, and can access the book on both my iPhone and iPad. The photo above shows two screenshots of the application in it's early stages. The left one is showing me unlocking and creating an account. To the right of that, it shows the books that can be purchased. One of my favourite parts of the application was that you could snap a photo of anything or anyone, and turn it into a page to colour. 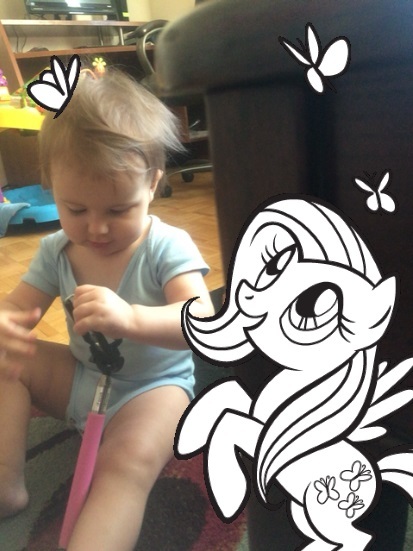 I could of turned my daughter into a page to colour... instead, I decided to have her sitting next to her little pony friend! She's still a little young for this creative toy, but I'm sure that we will have plenty of fun with it as she's growing. Honestly, I LOVE the idea of the book, and have spent quite a bit of time playing with it. Interested in buying a paper-to-digital colouring book for yourself or your little one? Sure you are... click here to grab yours today. Interested in checking out their Facebook, and Twitter? Of course you do... you never know when you may come across a deal!